Since I was still young I do love to munched coconut, drink its refreshing and clear sweet juice. My father planted coconuts in front of our house and in our backyard so we could enjoy the delicious fruits. And we did enjoy it every now and then. Whenever I want to eat the coconut meat and drink its juice which is very helpful to cleanse your system. I could just asked someone from the compound to climb the tree and get me but I have to pay that person too. 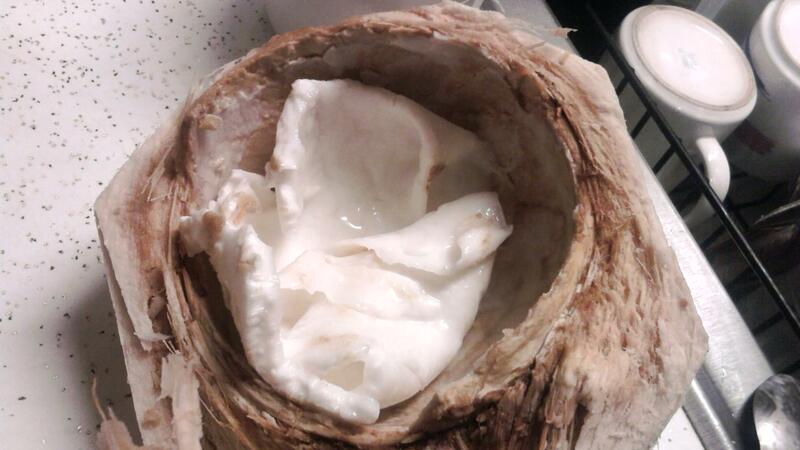 Now I am here in US, I haven't eaten the fresh young coconut meat at all until one day. We went to the store for the grocery, I did found a young coconut so immediately I grabbed one and opened it. At least, my body has tried to eat the this one after 2 years of being in this foreign land. After that day, we check out the western decor hoping that we could find nice decoration for our future new house.